Posts and pages about the various tools used by authors, editors and publishers. Motorcycling became a big part of my life back in October 2006. I took a class, got my license, and purchased a used 250 cc Honda Rebel. After putting 1,000 miles on it during that winter, I sold it and bought a new adventure-tourer, a 2007 Suzuki V-Strom 650. Since then I have ridden over 46,000 miles up and down the west coast of the United States and Canada, almost all of it solo. During my trips I have recorded my experiences in handwritten journals. Recently I pulled out my journals and read them from the beginning. It was fascinating to rediscover the adventures I’ve had, the people I’ve met, and the places I’ve seen. What made the rediscovery more profound was the realization that the ink I saw on paper was laid down at the time it happened. Even my handwriting changed based on how excited or tired I was at the time. In recent months I began taking an iPad on my trips and would type my journal notes on that, leaving pen and paper at home. At first I thought using the iPad was a better way to go because my notes were longer and more detailed. But, compared to my handwritten journals, they lacked character. A good way to understand the difference is with an example of communications between friends. If Jane wants to tell Mary about the lunch she had with her new boyfriend, John, she could send Mary an email. In that email she could use descriptive text and even emoticons like and other forms of non-verbal communication, such as LOL and OMG. Or, Jane could take Mary out to lunch and tell her in person, using body language, tone of voice, and facial expressions to convey the story. Using this analogy, typed notes using a journaling app on my iPad is like Jane’s email, and it can only convey a certain amount of character regardless of how voluminous the notes may be. 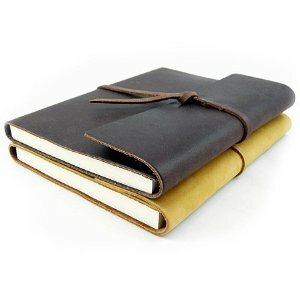 A handwritten journal is more like the face-to-face lunch. I have vowed to change back to the old way of journaling my trips by taking my small, leather-bound journals and a pen and making notes during break stops and at night before bed. I can always transcribe my notes and expand on them when updating my blog back at home. For me, when it comes to travel journaling, the handwritten approach is the best way to go. I discovered Scrivener after reading an AMA (“Ask Me Anything”) thread on Reddit by author Michael J. Sullivan, and it’s easy to see why he likes it so much. It’s more than a word processor, it’s a writer’s tool. The premise takes a word processor and adds tools and methods that help you stay organized as you write. Scrivener is also non-linear. Instead of having one long document, you can write individual scenes and then organize those scenes into chapters — and you can experiment by changing the order of those scenes with simple drag-and-drop maneuvers. This tool is worth a few hundred dollars, but it costs less than $50. It’s produced by a small team in the U.K., originally just for the Mac, with a brand new Windows version just released in November, 2011. The interface is easy to use yet has the complexity under the hood to let you really take charge of your writing project. Scrivener isn’t just for fiction writers. Screenwriters can use it as well as researchers and any producer of non-fiction. I have found it to be extremely useful as I work on my book and am amazed at just how much it adds to my writing experience.